7 days left: Submit for the Spring Issue! The deadline for submissions for the spring issue is officially ONE WEEK away. In case you missed it, the theme for the upcoming issue is Submerged//Unearthed: Narratives of the End. GS&NS has been receiving a lot of inquiries asking for more guidance on this topic and we have a whole blog post dedicated to prompts. Also check out the first announcement post here. 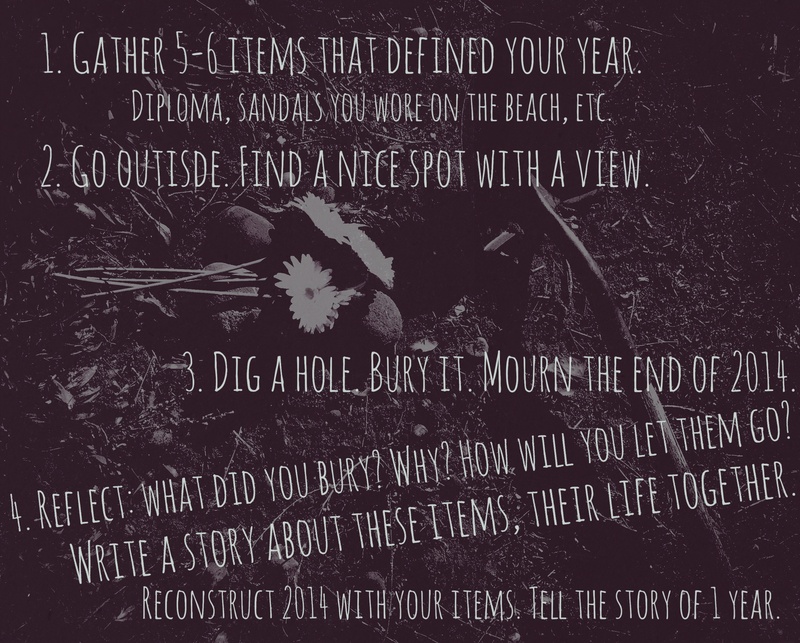 A burial activity to inspire spring issue submissions. Think of the theme as a guideline, a point of inspiration, and a point of departure. Rely on your creative skills and artistic eye, and trust your instincts. Ready to submit now? Submissions directions are detailed here. Direct all questions/inquiries to girlsensenonsense@gmail.com or you can always find us on Facebook (GirlSense & NonSense), Twitter, and Instagram (@gsandns). We can’t wait to see what you come up with. Good luck! “Dear 2014” – a poem.